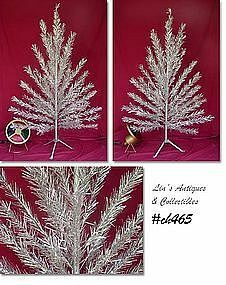 VERY PRETTY STRAIGHT NEEDLE ALUMINUM TREE BY STAR BAND COMPANY! THIS IS THE "SPARKLER" MODEL, HAS 2 PIECE WOOD CENTER POLE AND TRI-POD TYPE BASE. THERE ARE 49 LIMBS THAT MEASURE 22" IN LENGTH AND THEY ARE IN VERY GOOD CONDITION (I PUT NEW TAPE ON THE ENDS BECAUSE THE OLD TAPE HAD YELLOWED). ONE LIMB HAS ALWAYS BEEN USED AS THE TOP BRANCH BECAUSE THE ALUMINUM HAS SEPARATED IN SEVERAL PLACES -- OF NO MATTER WHEN USED AS THE TOP LIMB BECAUSE MOST TREE TOPPERS "SQUISH" THE ALUMINUM. HOWEVER, I AM INCLUDING AN EXTRA LIMB JUST IN CASE YOU DON'T USE A TIGHT FITTING TREE TOPPER. THE COLOR WHEEL HAS A GOLD METAL MOTOR HOUSING AND BASE, ONE PIECE WHEEL WITH FOUR PLASTIC COLOR PANELS, HAS ON/OFF BUTTON AND RUNS GREAT! I ESPECIALLY LIKE THIS TREE BECAUSE THE LIMBS ARE A NICE LENGTH AND IT'S NOT SO FULL THAT IT DETRACTS FROM THE BEAUTY OF YOUR ORNAMENTS -- YOU CAN PUT SEVERAL ON A LIMB AND THEY CAN ALL BE VIEWED. VERY NICE ITEMS! !